Are you looking for info on the 1914 penny value? Did you know there are rare 1914 pennies? Perhaps you have the valuable 1914-D (Denver) cent or scarce 1914-S (San Francisco) penny. 1914 pennies are very difficult to find in pocket change these days. While they’re not considered scarce as compared to rare coins — like the 1909-S VDB penny or 1955 doubled die cent — 1914 pennies from the Philadelphia Mint (no mintmark) are nevertheless tough collectibles. The 1914-D penny is a rare key-date coin. The 1914-S penny is considered one of the semi-key Lincoln cents. At one time, the 1914-S penny was actually considered a rare date. But over time, coin collectors realized it was the 1914-D cent that was actually scarcer — because fewer of them were made and far fewer were saved in collectible condition. The Philadelphia Mint made more early Lincoln cents than did the western mints, on average, because most of America’s population was still close to the East Coast in the first decades of the 20th century. At the time, coin collectors tended to favor Philadelphia-Mint coins over mintmarked coins, and thus relatively few Lincoln pennies from the Denver and San Francisco Mints were preserved by collectors during that period. 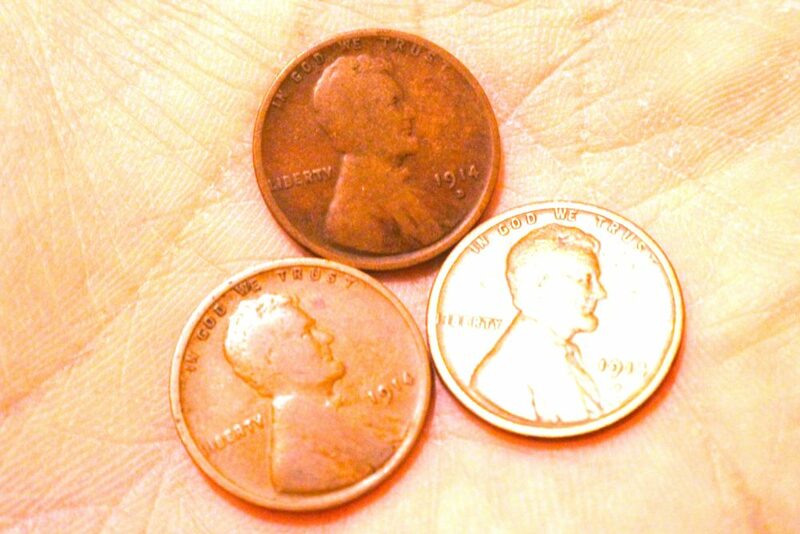 All 1914 pennies are worth more than face value, which is why it pays to look for these coins in your spare change. What Are 1914 Pennies Worth? 1914 pennies range in value from as little as 50 cents to more than $1,000. What makes the difference between a 50-cent 1914 penny and one worth 4 figures? In general, 1914 pennies with less wear are worth more money than those with lots of wear. And a 1914 penny with an “S” mintmark is worth more than one without a mintmark. The 1914-D penny is the king of all 1914 Lincoln cents and is the one most coin collectors are looking for. *Values are for problem-free coins (no cleanings, holes, porosity, etc.) in circulated condition unless otherwise specified. Uncirculated 1914 pennies are worth much more than the prices listed here. Coins with much wear are worth closer to the lower ends of the price ranges above, and those with less wear have values on the upper ends of the ranges. What Else Happened When Your 1914 Penny Was Made? World War I began when Austrian Archduke Francis Ferdinand and his wife Sophie were assassinated by Serbian radical Gavrilo Princip in Sarajevo. Austria subsequently declared war on Serbia and Germany did the same against Russia and France. Britain, meanwhile, rose against Germany. The Panama Canal officially opened, following a decade of construction. The first traffic signal utilizing red and green lights went into operation in Cleveland, Ohio. George Washington Carver, who was honored on a half dollar later in the 20th century, began experimentally growing peanuts as a new crop. Comedy actor Charlie Chaplin popularized his iconic “Little Tramp” character in a silent film called The Tramp. A new Dodge Brothers Touring Car cost $500 in 1914, while gas cost just 14 cents per gallon. Buying a new home in 1914 cost about $3,500. A gallon of milk was 12 cents, while a loaf of bread cost 6 cents. See? Those 1914 pennies did a lot of hard work back then! It’s amazing how much inflation has increased the cost of living. And, as you’ve found out in this post, even a 1914 penny is worth more than one cent today.